European Azerbaijanis Congress (EAC) holds a campaign to collect signatures for the recognition of Khojaly genocide, the State Committee on Work with the Diaspora told Trend. The purpose of the event, held in conjunction with the International Day of Human Rights, is to inform the world community about the fact that the tragedy, which took place in the late 20th century, is a crime not only against the people of Azerbaijan, but also one of the worst crimes against humanity. European Azerbaijanis Congress plans to send petitions to the socio-political structure of the EU on the recognition and political assessment of the Khojaly genocide. 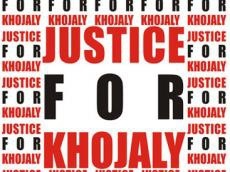 In this regard, European Azerbaijanis Congress organizes the collection of signatures for the recognition of Khojaly genocide and calls on Diaspora organizations of Azerbaijan and Azerbaijanis living abroad to join this action.